Multiple Input Multiple Output (MIMO) antenna systems are used in many wireless standards including IEEE802.11, 3GPP LTE, WiMax and the emerging 5G systems to enhanced data throughput even under conditions of interference, signal fading, and multipath. Excelwave Technologies' DAS and small cell antennas support 2x2 MIMO system, larger scale MIMO antennas and massive MIMO antenna arrays for 5G systems are available upon request. Excelwave Technologies also offer high quality PIM certified Single Input Single Output (SISO) antennas for legacy networks. These antennas include omni directional indoor antennas for ceiling mount, directional indoor antennas for wall mount and direcional antenna for outdoor pole mount. All of these antenna products are designed and manfuactured for low PIM rating to improve QoA and QoS of the communication networks. 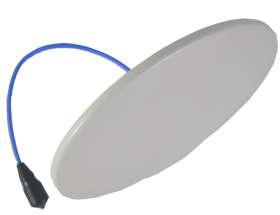 EAD-698-6000-C-S-4 series antennas are horizontally polarized, approximant omni but offering more even coverage in rectangular areas, which makes them superior candidates for coverages in hallways, subway stations, tunnels and underground parking where low ceiling, long and narrow aisles are common. The light color and ultra low profile radome allow them blend into environment perfectly. They cover 698-6000MHz full frequency range with one port, which is universal for various applications such as dual band WiFi, WiMax, public safety voice radio, 2G, 3G and 4G voice and broadband data communications.